Balsa Block Bagel, munch, crunch, balsa and bagel, oh my! 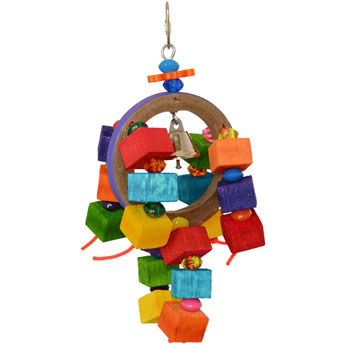 A cascade of vibrantly colored balsa blocks and bright beads dangle in six arms from the birdie bagel core. A liberty bell is in the middle for a ring-a-dinging good time! There's nickel plated quick link on top for easy hanging. A fun, chewable toy with lots of motion, color and chewing fun. Perfect for the mid-sized beaks in your life!